What's the idle current on the final stages of each channel with no signal present? If that's the same as Bias(like I think it is) than its at 30mA on both channels. That's with the unit running off the variac, holding voltage at 117v. So, should I just put it back together and forget about it? I'm satisfied with it... for now. It will need transistors in the future(to get rid of the extra noise) but for now I have no problem running it as is. ...As long as it wont have a major catastrophe. I suppose a signal tracer would be the way to go to find a noisy stage. But then with all that probing about, I'd fret over another slipped prod. Might be best to leave it be. It looks to be Lafayette's TOTL receiver for 1968. And here's a couple tape transports I found. The Allied version has a separate record/play preamp. 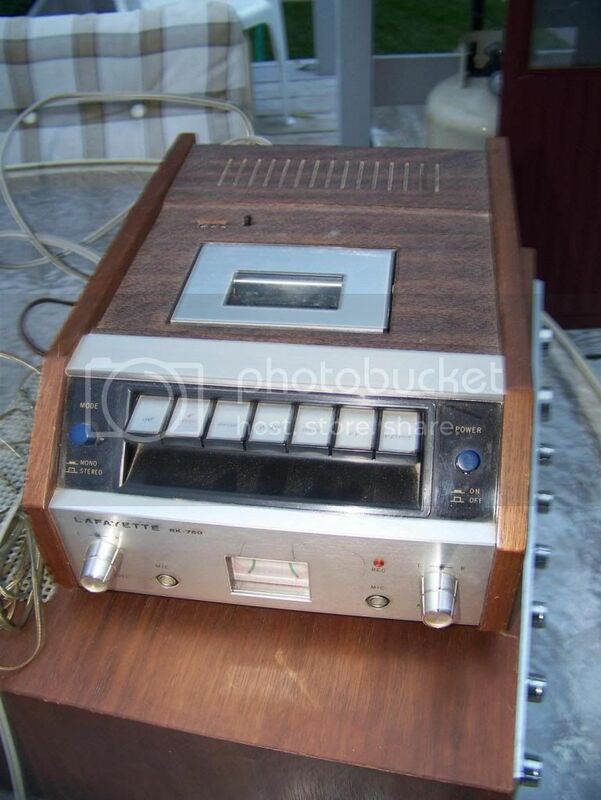 Without that, you could play pre-recorded tapes through the Tape Head input. And a more bare-bones BSR surplus deck sold by McGee Radio. I once owned a real cheapy transport, cost me maybe $20. 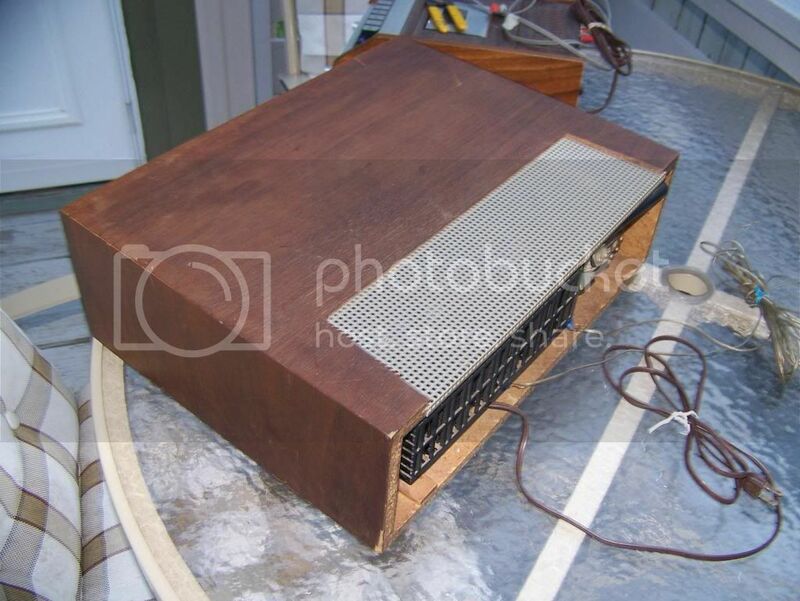 No case, no front panel, nuttin'. Motor, transport, heads. I hooked it into the head connections on a portable cassette, and could actually record/play mono with it that way! Thanks a lot for those catalog pages! Its always cool looking at some of the vintage ads for this stuff. Well guys, I jumped the gun here I thought it'd be good to go. Sounds pretty good on the head phones. Finally attached my test speakers to it. Left channel sounds really garbled and low on volume . I think that's why I put it back away last year, and I kind of forgot about that problem. It's odd that it sounds fine on headphones. But, if the selector is on main or main/remote it sounds garbled through the head phones as well. If I put it back on remote or phones setting, it will go back to sounding just fine. Something doesn't like the load, and im thinking it has to have something to do with no current going through those emitter resistors on the left channel of the amp board. Oddly enough, they are getting voltage when measured from one side to ground. But no difference in that measurement from either side of the 2 resistors. Measure the voltage from one side to ground again ont he bad channel and compare it to the good channel. Then take other voltage measurements on the bad channel and compare to the good channel. Once you find a wrong voltage then you know what stage and components to check. That's how some problems such as this one will be found. Ok, I did find an issue with one of my replacement driver transistors. So, since I had some NTE 129 transistors on hand I swapped the one I suspected out. Voltage at those points became closer to each other (between the 2 channels). Not perfect but better. Still some fluctuation between the 2 sides. Good news and Bad news I now have good sound coming out of the speakers on the right and the left. They sound equal, but now there is another problem to figure out before I make some re-adjustments. I've had the receiver running off of the variac, then going to my dim bulb tester with a 90w bulb in it. Previously running it at 117, the bulb did not light. Now, I can't get voltage up that high anymore and the light starts to come on at around 80 volts AC. So, its indicating a short. I can't figure this out, as all I changed was that transistor. I then put another NTE129 in to have a matching set. Same exact situation. Now, I also don't have these permanently mounted yet. They are just soldered onto the bottom of the pcb. I know they aren't supposed to ground to the case, so it shouldn't be an issue that they are floating at the moment. Before being asked, they are wired in the same as the 2 I took out. I believe that what I replaced and know that the NTE129 are pnp transistors. But, what kind of issue would show up if they were wired in backwards? It could be that the extra current being drawn by the now properly functioning output stage is making the bulb come on. I got a little worried last night, but after doing more testing and following the circuitry around things seem fine. I swapped the bulb for a 300w and no light at all going back up to 117 on the variac. No sizzling or smells. I re-adjusted the bias and the balance between the channels like the service manual states. With the Variac at 117v, I set the balance at 34v per channel, and bias around 29-30ma on both channels. It was varying a bit with the heat of the output transistors while I was messing with it. Last check I made after it sat untouched for 5 minutes, they were both at 29ma, so I just left it. Manual says 30, so its not far off. I'd like to thank everyone for the help, all the way back from last year to now. This stuff can be quite complicated and in general I basically just tinker around. I don't do any of this full time or that often. Pretty sporadic. and I just had to get away from this project for awhile. So far I got to say I'm happy. Its not fully restored as I was thinking I originally wanted, but as long as it is stable and sounds good, I'm all right with that. I got new electrolytic caps in it, some new transistors. Still needs some more transistors to get rid of the hiss in the one channel. Right now, I got it playing a cassette through the matching Lafayette cassette deck (from the same era). Sounding pretty good playing some Judas Priest through a set of 50watt Jenson speakers. Think I'm going to set this up in the living room. I got my Realistic STA430 in there now, and it don't have enough power. This thing has more than enough, but I'm still on the lookout for something a bit more powerful for my main set up. Just checked DC offset after running for a bit. It bounces around on both channels from -2 up to 25mv. It hangs around 0-5 the most on each channel. Don't seem too bad from what I've seen elsewhere online. Supposedly your ok with up to 50mv, so in my case I'm good! You might want to consider adding a 1 amp fuse inline with each ~68 volt wire from the power supply going to each channel. The fuse and any exposed conductive material would have to be insulated. Shrink tubing or even electrical tape would work fine. If a channel starts to go off the deep end for whatever reason, blowing this fuse might help save some of the components. Without this fuse, if problems develop and you blow only the line fuse, by the time this fuse blows, the component(s) failing will generally have taken out more components. It's a bit of cheap insurance. 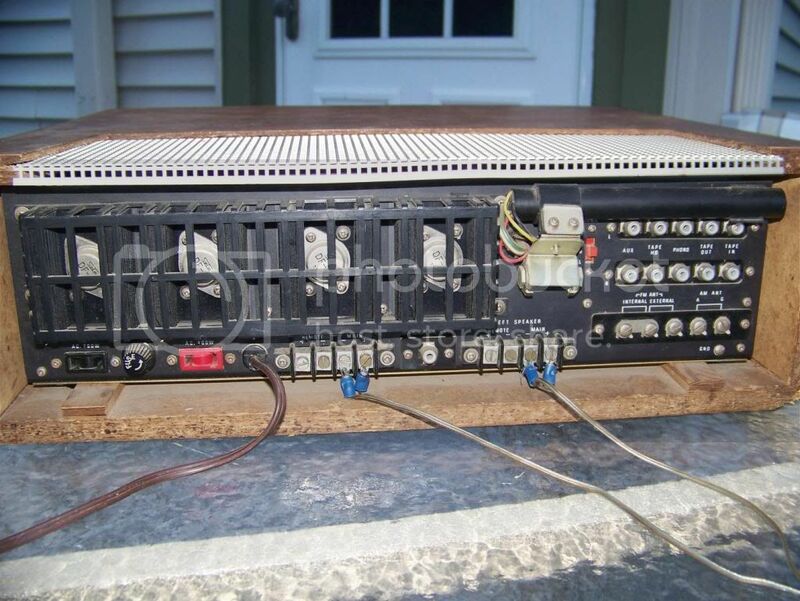 Lafayette started adding individual channel fuses in their main DC voltage connection to most of their receivers and amplifiers after the LR-1500T and TA were put to pasture. 1 question though, slow blow or fast blow? I would assume fast blow, but what do I know?! You would not want to use a slow blow fuse in this application. The fuses are a good idea for sure, although it has been my experience that they are there only to save the power supply as in every instance when I had a fuse blow I had to replace output transistors and driver transistors. Then again without the fuses I would have had to replace a lot more parts. hmm, It does have the "Computer-Matic protective circuitry". I wonder how well that works anymore? I have no clue how to align that though, and I don't have the equipment that the service manual says is needed. So, I added the 1amp fuses. I'm guessing that's why they originally didn't. I saw somewhere where Lafayette claimed the protection circuits work faster than fuses, and that nothing needs replacement when it trips. Well, I got the fuse holders located above the chassis, so there is easier access. I kept them by the power supply, so hopefully they don't affect radio reception. 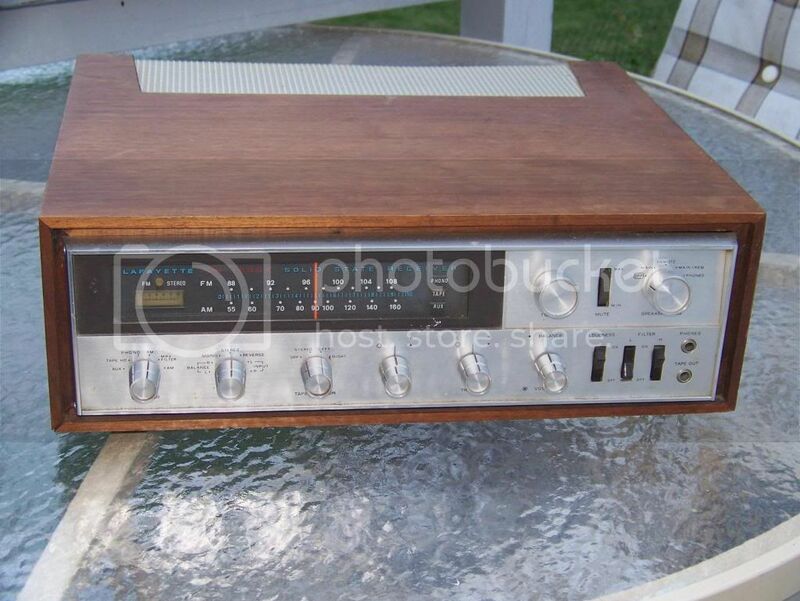 I'll get some pics up later of it with the RK-760 tape deck. For wood cabinets I like to use this stuff. If you're using fuse holders, periodically you can pop the fuses, put a current meter across the fuse terminals and check the idling current of 30 MA to make sure it hasn't creeped up to some nasty value. Unfortunately, no pics. I still don't know what happened to them. I took some after I went over the case, and they disappeared. Now i'm just being lazy, because I haven't wanted to pull the receiver out of the cabinet I have it in to do a reshoot. Got it all hooked up and its been doing great. Actually, its doing better than great. With use, the old thing has gotten quieter. Not as much hiss or odd sounds when the volume is down. Station reception is great (the STA430 didn't do to good in that location). The unit sounds great paired to the speakers I use in that room. Manualman: Yup, that'd be easy to do now, and to top it off, I can do it without even pulling the chassis out of its wooden case. Its got a mesh metal panel towards the back that can easily be removed, and I can reach them from the opening. Here's some pictures I found that were still online for view. These are from when I got the 2, a little over 5 years ago. Wow! RK-760 sold a lot of them. I think I still have tape heads for it. I know I have lots of tape heads for Lafayette machines.